So, you want to know about drinking cannabis? Now that the marijuana industry is growing – and cannabis is legal in several states – cannabis companies are looking for different ways to provide users with a smoke-free high. Enter Grainwave – THC Cannabis Beer. Grainwave has partnered with Keef Cola to produce the first THC infused beer in Colorado. But, is cannabis beer really beer? Yes! Will it get you high? Yes. Each Grainwave/Keef Cola cannabis-infused beer is micro infused with 5 mg of THC. You can consume it in small doses to limit the impact of your high. How is Grainwave – THC Cannabis Beer Made? 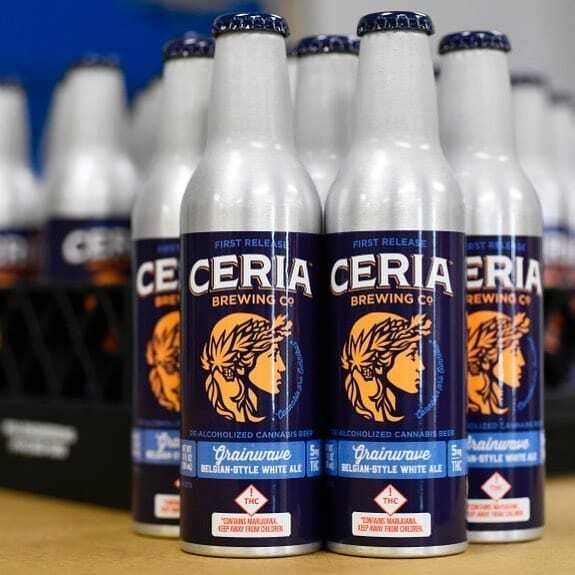 AN EXTRAORDINARY BEER CERIA (rhymes with “area”) Grainwave™ is a refreshing, medium-bodied Belgian-Style White Ale, brewed with blood orange peel and coriander, de-alcoholized and microdosed with 5mg THC, for a new spin on a Belgian classic. Grainwave craft’s it’s beers using traditional, proven brewing techniques and high-quality malts, hops and spices for optimal flavor. Once they have arrived at the perfect liquid, they remove the alcohol and add the cannabis extract, carefully metering to achieve an exact amount of THC in every beer. Grainwave tests samples constantly to ensure they offer an incredible tasting beer that delivers an extraordinary experience every time. Cannabis-Infused Beer is beer is infused with Cannabidiol (CBD) and Tetrahydrocannabinol (THC). Cannabis-Infused beer is also de-alcoholized. Presently, THC-infused marijuana beer is available in select states where marijuana is legal, including Colorado at Oasis Cannabis Superstore! Yes. Cannabis beers and cannabis-infused beers will get you high if they contain THC. Grainwave beers come in 10 ounce bottles with 5 mg of THC per bottle. Where can I buy Cannabis beer? Oasis Cannabis Superstore is proud to announce it now sells cannabis beer! Grainwave by Ceria in partnership with Keef Cola is a first-of-its-kind beer now available at both Oasis Cannabis Superstore locations. Keef develops, produces, and distributes cannabis-infused product of all kinds. Products include beverages, edibles, and CO2-extracted oil for vape cartridges. Founded in Boulder, CO, Keef has been at the forefront social cannabis product innovation, development and education since 2010. In 2015, Keef’s Bubba Kush Root Beer won Best Edible at the High Times Cannabis Cup, beating over 150 entries from across the United States. Keef products are currently available at over 800 dispensaries in Colorado, California, Arizona, and Puerto Rico. Visit us at our two locations in Denver. Our knowledgeable staff is always happy to help find the right products for you. With over two hundred different strains, edibles and oils, Oasis Cannabis is your source for everything cannabis.